Vacuum adapters have 24/40 joints. Bent adapter has a 105° angle between the top outer joint and bottom inner joint. 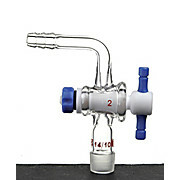 Straight adapter has a top outer joint and bottom inner joint. Both adapters have 24/40 joints and include a 3/8" hose connector. 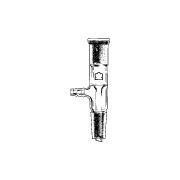 Synthware vacuum adapter has a standard taper outer joint and a serrated hose connection. 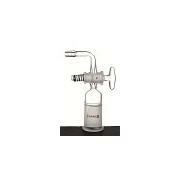 Ideal for use as a vent or for the introduction of pressure/vacuum. Vacuum Takeoff Adapter, Microscale, Synthware, Joint: 14/10, supplied with one compression cap, one Viton O-ring and one PTFE-faced silicone septum. 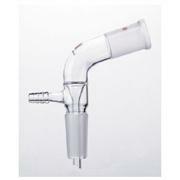 Vacuum Adapter, Microscale, PTFE Stopcock, Synthware, Joint: 14/10, Stopcock Bore: 2mm, Hose Connection OD: 8mm. With 14/20 or 19/22 joints, outer joint at top and inner at bottom. Size B hose connection is on side. With side hose connection and drip tip. Synthware vacuum adapter with a serrated hose connection turned 90 degrees to the standard taper inner joint. 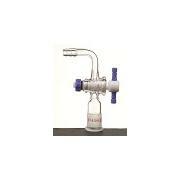 The PTFE stopcock has a 2 mm bore and is used to regulate the flow of gasses or liquids into reaction systems. Synthware vacuum adapter with a serrated hose connection turned 90 degrees to the standard taper inner joint. 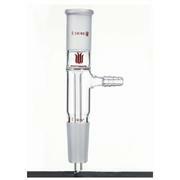 The glass stopcock has a 2 mm bore and is used to regulate the flow of gasses or liquids into reaction systems. Synthware vacuum adapter with a serrated hose connection 180 degrees to the standard taper inner joint. 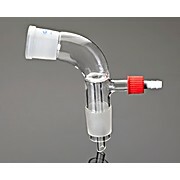 The glass stopcock has a 2 mm bore and is used to regulate the flow of gasses or liquids into reaction systems. 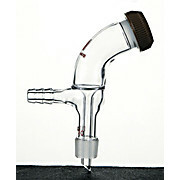 Synthware vacuum adapter with a serrated hose connection 180 degrees to the standard taper inner joint. 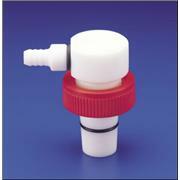 The PTFE stopcock has a 2 mm bore and is used to regulate the flow of gasses or liquids into reaction systems. 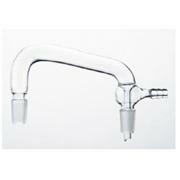 Synthware vacuum take-off adapter with drip tip. The upper outer and lower inner standard taper joints are the same size. Synthware vacuum transfer adapter with PTFE stopcocks and standard taper inner joint. 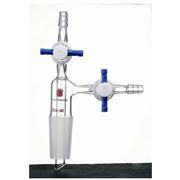 Used for the transfer of sensitive and hazardous solutions while under vacuum. 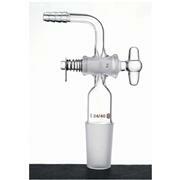 Used with plain stem Buchner funnels and pluro-stopper. Hose connector has an O.D. of 10mm at the largest serration. Joint is a standard taper inner joint. Pluro-stoppers are not included. With two standard taper inner joints that are parallel and at a 75 degree angle to the connecting tube. Distance between joints is 100mm. 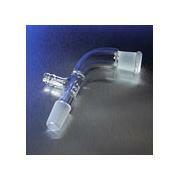 Vertical adapter with vacuum take-off and drip tip. With a hose connector and a drip tip. Synthware vacuum adapter with a serrated hose connection turned 90 degrees to the standard taper outer joint. 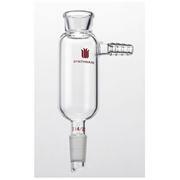 The glass stopcock has a 2 mm bore and is used to regulate the flow of gasses or liquids into reaction systems. Synthware vacuum adapter with a serrated hose connection turned 90 degrees to the standard taper outer joint. 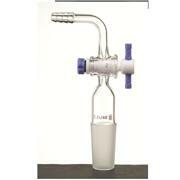 The PTFE stopcock has a 2 mm bore and is used to regulate the flow of gasses or liquids into reaction systems. Thomas No. 1165A11 14/20 vacuum adapter, 30mm stem below the joint. Thomas No. 1165A12 14/20 vacuum adapter, 175mm stem below the joint. Thomas No. 1165A13 19/22 vacuum adapter, 30mm stem below the joint. 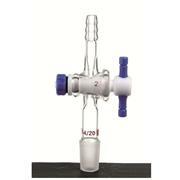 Used as distilling head for connecting top of column with condenser. 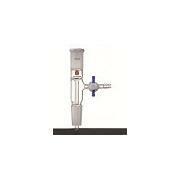 Top 10/30 standard taper joint for 76mm immersion thermometer. Synthware vacuum adapter with 2mm straight bore PTFE stopcock on the hose connection.The upper outer and lower inner standard taper joints are the same size. Synthware vacuum adapter with 2mm straight bore glass stopcock on the hose connection.The upper outer and lower inner standard taper joints are the same size. Vacuum adapter with 2mm bore stopcock on side arm. Useful as a vacuum adapter or addition tube. Stem length below joint, 130MM. Hose connection is Size A for 5/16th I.D. tubing. 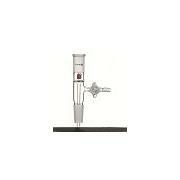 Synthware vacuum take-off adapter with drip tip. 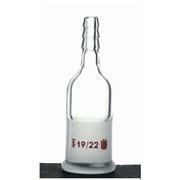 For use in vacuum distillation. Adapter is bent at 105 degrees. Serrated hose connection is attached to vacuum source. With standard taper top outer joint and lower inner joint of the same size. Stem below standard taper joint is 30mm. Hose connection is size C.
Outer joint at angle of 105 degree. Hose connection opposite top joint. Stem below joint, 30mm. 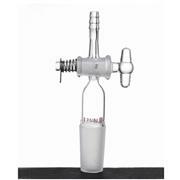 Can be used as a distilling head to connect a condenser to the top of the distillation column. 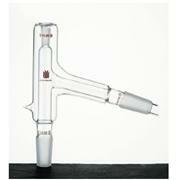 The 10/18 top joint accomadates a 76mm immersion thermometer.